Porcini mushrooms are different than other types of mushrooms, as they have a meaty texture, earthy scent, and pronounced flavor. They are Italy’s favorite wild mushroom, and make a great addition to pastas, sauces, pizzas, soups, and more! 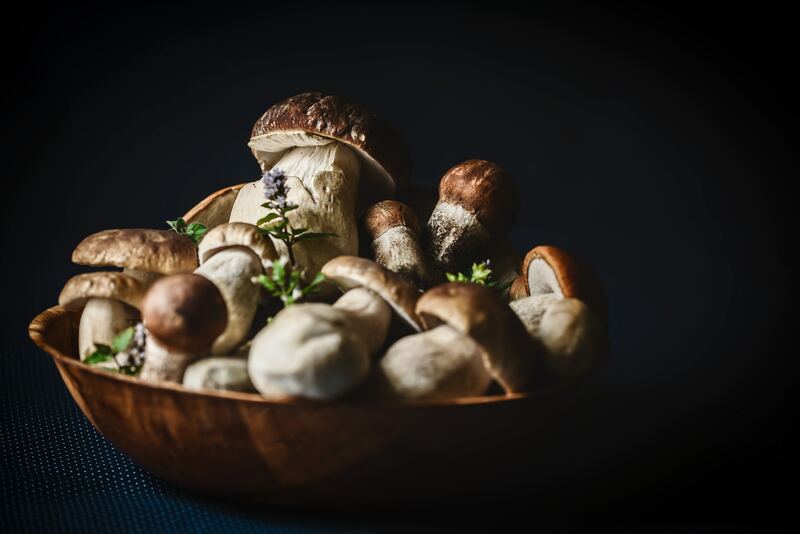 Continue reading to learn more about the mushrooms and how to cook with them, then come into Giolitti Deli to purchase some dried porcini mushrooms at our deli! Making stewed porcini is a simple way to use the mushrooms as a pasta sauce, side dish, or to complement a main course such as steak. Porcini mushrooms can be found all over Tuscany, and are traditionally sauteed with a form of wild mint called nepitella. However, this wild mint is not easy to find in other areas of the world, so you can use a sprig of fresh thyme when making your own stewed mushrooms. You will also need ¼ cup of olive oil, two cloves of garlic, one diced tomato, salt and pepper, and one pound of freshly cleaned porcini mushrooms. While fresh porcini can be difficult to find in the U.S., you can often find the mushroom dried. To reconstitute porcini, simply soak the mushroom in hot water for 20-30 minutes. After reconstituting the mushrooms, it’s important to scoop the mushrooms from the water (they float), as they can be sandy. Strain the mushroom water to remove any sand and use that as well! Start by sauteeing the garlic and thyme in olive oil over medium heat for one to two minutes. Then add in porcini mushrooms and increase the heat; cook and stir until the mushrooms have given off their water. Reduce the heat, stir in the tomato and simmer for about 30 minutes. Then season with salt and pepper, and use as a sauce or side dish! Porcini mushrooms can also be ground in a spice grinder to create your own seasoning to coat meat and poultry. There are so many uses for the powder that will add delicious flavor to any meal- such as rubbing steak with olive oil and porcini powder, sauteeing diced potatoes in duck fat and powdered porcini or hashbrowns, or even adding the powder into a dough for buttermilk biscuits. Before you grind up dried porcini mushrooms, first pick through and discard any small stones. If your mushrooms are too big for the coffee or spice grinder, break them into smaller pieces or pulse them in a food processor. Grind a handful at a time for about thirty seconds until they become a fine powder. Now that you have your powder, transfer it to a clean, dry bottle and store in a cool, dark place. The porcini powder may quickly become your new favorite spice in your kitchen! This entry was posted on Wednesday, November 7th, 2018	at 9:50 pm	and is filed under Food	. You can follow any responses to this entry through the RSS 2.0	feed. Both comments and pings are currently closed.